Two sizes are available. 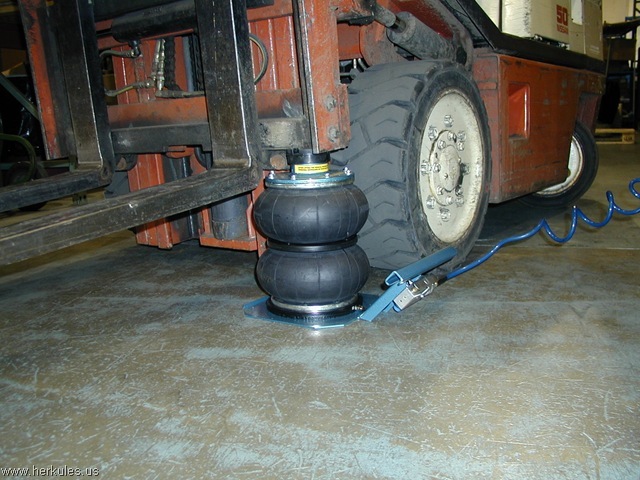 The AJ2 is equipped with 2 air bags and has a closed height of 6-½” and a raised height of 13”. The AJ3 is equipped with 3 air bags and has a closed height of 7-7/8” and a raised height of 19-1/4”. Both have a capacity of 4500 lbs. A psi of 90-110 is required. The Air Jacks are light-weight yet provide heavy-duty results with unlimited possible applications. Ideal for positioning anything to a more ergonomically correct working height, or raising equipment for placing components in position more effectively. They are 100% air operated and simple to use. Just attach to an air line. Optional accessories include a two inch and a four inch extension for increasing the raised height. Herkules Equipment Corporation has been manufacturing Pneumatic Lifting Equipment for over 25 years, including (standard and custom); Lift Tables, Lift & Rotates, Lift & Tilts, Operator Lifts, Power Rotate/Turntable Systems, Lifts for Integration, Cart Positioners, and Pallet Positioners. Herkules has now expanded their product offerings with electric lift systems and hydraulic lift systems. 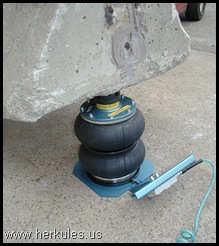 This entry was posted in News and tagged Herkules Portable Air Jacks - A Quick, Solid Jack for Any Lifting Needed by adminenkon. Bookmark the permalink.